Seriot is a Windows application that provides a link between serial hardware and the Internet of Things. The main functions of Seriot are to listen to the serial port for sensor data records from a sending device i.e. Arduino, Netduino, PIC etc… and log the data to a file and optionally send them to the Internet. Currently Seriot supports sending records to ThingSpeak with more options planned for the future. In order for Seriot to read data from the serial port the sending device must send the data in the following format. Each row/line must be separated with some type of line feed/break (configurable) and each row should optimally be sent from the device in one shot.The simple data format requires data rows be sent between record separators to mark one record set. The data rows can be in any order with any number of rows. Seriot can operate in 3 different modes depending on how you want to use it. The modes are configuration settings in the seriot.exe.config file. Select this mode by setting InteractiveMode to TRUE in the config file. When running in this mode Seriot will start up like a normal Windows application and will wait for the user to click Start to begin listening to the serial port. Once Start is clicked Seriot will continue to run and process records until stop is pressed. Chose this mode for initial testing or for running on a PC that logs a user on automatically. Select this mode by setting InteractiveMode to FALSE and SingleRecordsetMode to FALSE in the config file. 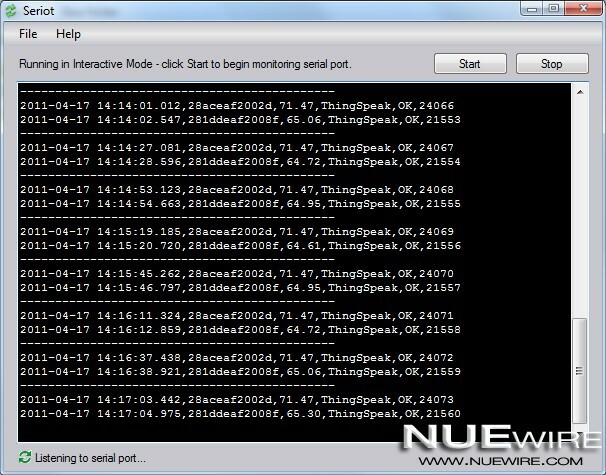 When running in this mode Seriot will immediately begin listening for records on the serial port and will continue to process records until the application is closed. Chose this mode for running Seriot as a background task at startup. Select this mode by setting InteractiveMode to FALSE and SingleRecordsetMode to TRUE in the config file. When running in this mode Seriot will immediately begin listening for records on the serial port. Once one record set has been processed the application will exit. Chose this mode for running Seriot as a background Scheduled task on an interval i.e. every 30 minutes. When scheduling a task set Seriot to run as SYSTEM to ensure it can access the correct resources. You can also create an account for it to run in the background, which is more secure. Seriot will automatically create a Logs folder within the directory it is run from. Two types of logs will be generated on the fly when needed. With ThingSpeak support enabled in the config file Seriot will read from a user defined sensor map while processing records and if it matches a sensor ID to a ThingSpeak channel/field in the map it will then post the data to ThingSpeak. You can define up to 99 sensors in the map and each sensor can independently map to a ThingSpeak channel/field. When configuring the map think about which ThingSpeak field you would like the sensor to map to then build the map. All settings for Seriot are contained within the Seriot.exe.config file. After editing the configuration file restart Seriot for the changes to take effect. To install Seriot just unpack the .zip file to your directory of choice. Double click Seriot.exe to start the application. Note: Ensure InteractiveMode = TRUE when running for the first time to test/troubleshoot your settings. can you add thingspeak twitter support? Shouldn’t be a problem to add support for ThingTweet, but the bigger question is what would you want to tweet? The value of every single channel/field/sensor update? One tweet per record set updated? If so what would the message be? Tweet at startup/shutdown of Seriot? Can you post a copy of your config file?